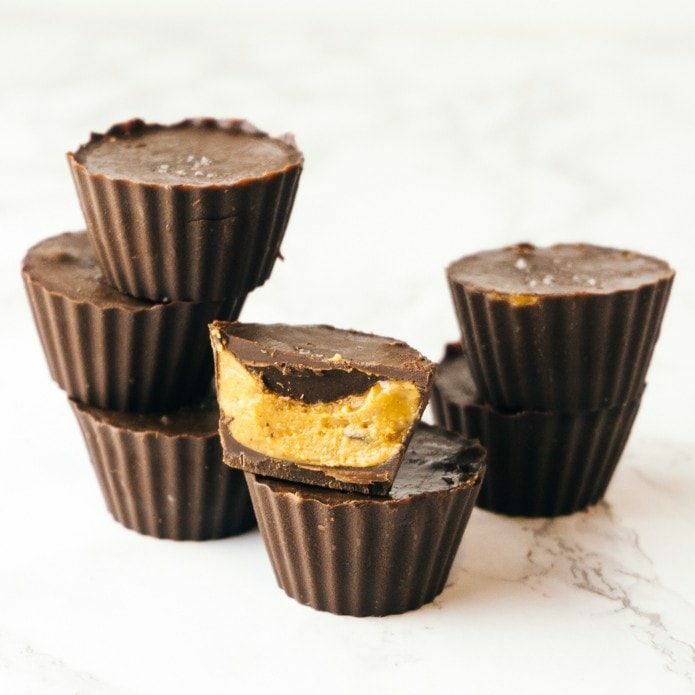 This homemade keto version of peanut butter cups is so delicious and so easy to make. This recipe comes together quickly after you gather the ingredients, and stores easily in the fridge for a quick keto dessert. Hands down, Reese’s peanut cups were my favorite childhood candy. Peanut butter and chocolate are a flavor match made in heaven. 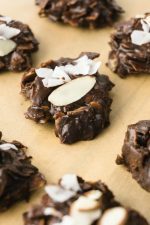 If you love peanut butter and chocolate as much as I do, you will love this keto version! Bonus: homemade peanut butter cups are a great edible gift you can make for Halloween or Christmas. Make a double batch and stash some in your freezer for future keto candy cravings. 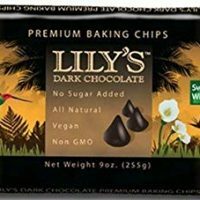 There are a few brands of keto chocolate on the market, but my favorite type to bake with is Lily’s Chocolate chips. They taste like rich, bittersweet chocolate – with no sweetener aftertaste. 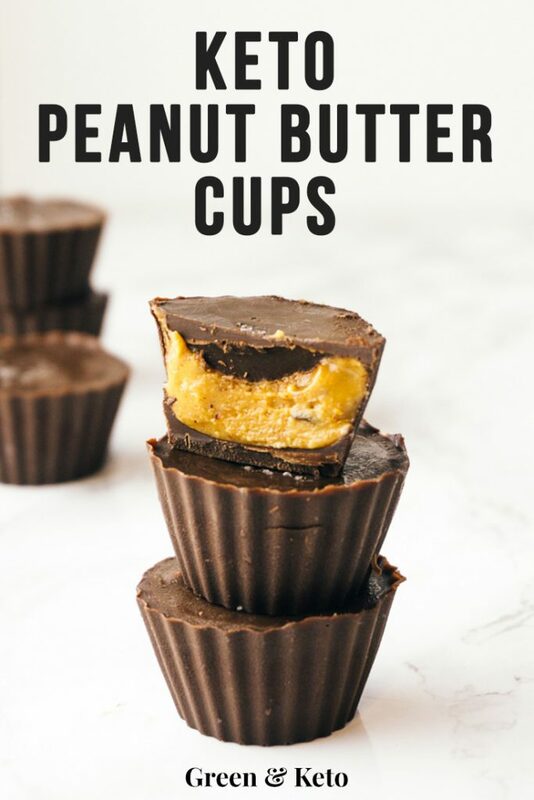 They melt well in this recipe to form the outer shell of our keto peanut butter cups. If you’ve been reading the labels in the grocery store, you already know that most peanut butter has added sugar. And that’s a no-go on the keto diet. 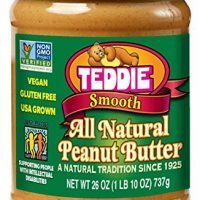 Luckily, there are several brands of peanut butter made with no added sugar. 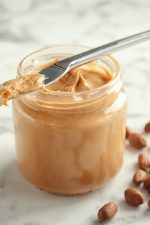 Click here to read all about peanut butter on the keto diet, and my top five no-sugar-added picks. If you don’t like peanut butter, or are allergic to peanuts, you can substitute almond, cashew or another nut butter for the peanut butter. 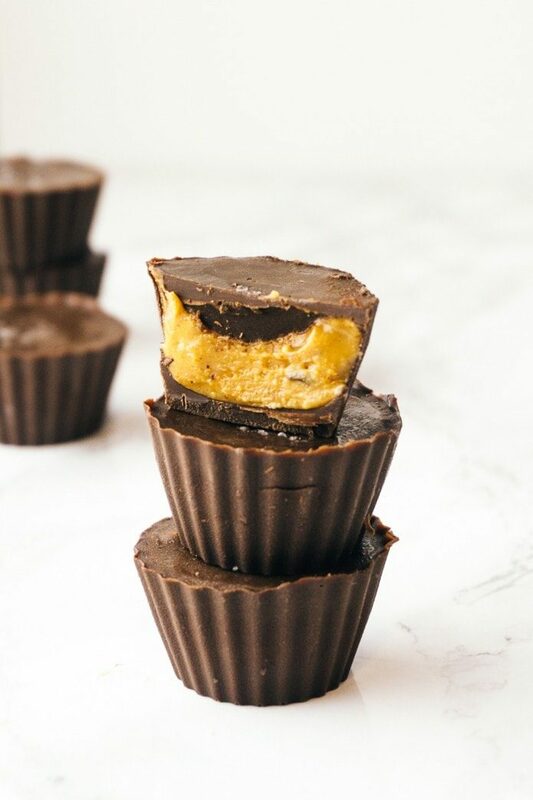 Keto peanut butter cups are super easy to make. The recipe has just a few easy steps. First up, warm the sugar-free peanut butter in a saucepan or a microwave safe bowl. You want it to be smooth and liquid for the next step. When the peanut butter is warm, add the powdered sweetener a little at a time until it’s completely incorporated. If your peanut butter comes without salt, you’ll want to add a pinch or two. Then, set the peanut butter mixture aside and let it cool to room temperature. Meanwhile, melt the sugar-free chocolate together with a bit of coconut oil. The coconut oil keeps the chocolate nice and shiny when it cools. Sure, we could go through all the hassle of tempering chocolate. But to be honest, its super tricky with this sugar-free kind. 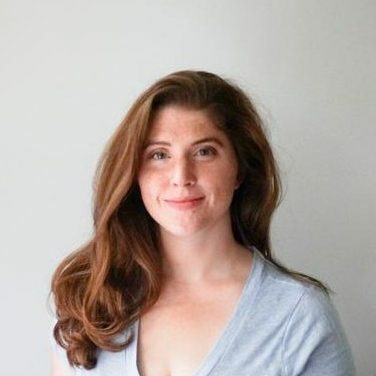 So, hey, let’s be easy on ourselves and skip it. So, once you have your chocolate melted, line the paper or silicone candy cups with a thin layer of the chocolate. I like to pour some in, and then invert the cups over the bowl to let the excess chocolate drain. Pop the lined cups in the fridge for a few minutes to let the chocolate set up. 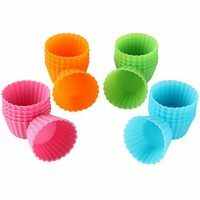 After the chocolate shell is firm, scoop or pipe the peanut butter filling on top of the chocolate in the muffin cups. Top with more of the melted chocolate, and chill again in the fridge until set. 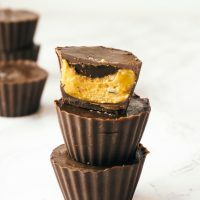 That’s it, you’ve made keto peanut butter cups! 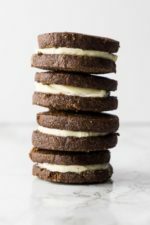 If you are a chocolate lover like me, you’ll like these other keto chocolate recipes: Keto No-Bake Cookies, Keto Oreos, Keto Brownies, and Two-Ingredient Chocolate Truffles. 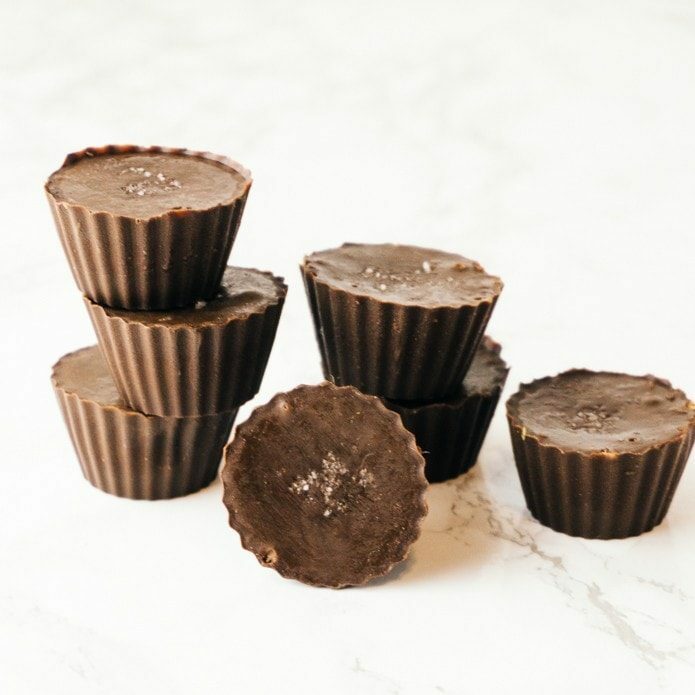 Keto Peanut Butter cups are a quick low carb dessert recipe with the classic flavor combination of peanut butter and chocolate. Melt the chocolate: Put the chocolate chips and the coconut oil in a heat-safe bowl. Melt the chocolate in the microwave in quick bursts of 15 seconds each. Stir in between each burst of heat, making sure that the chocolate does not burn. You can also melt the chocolate over a double boiler, if you prefer. 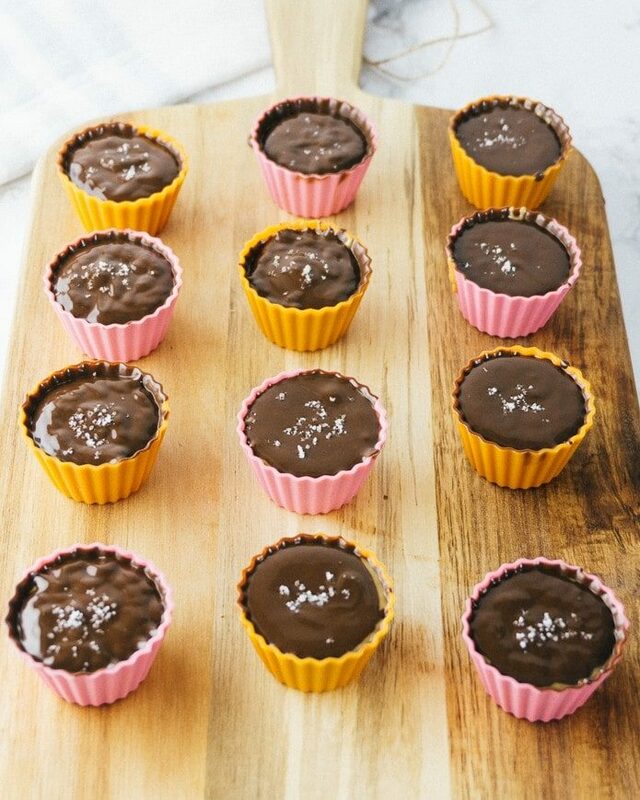 Line the cups: Pour a generous teaspoon of chocolate into silicone or foil candy cups. Swirl the chocolate up around the sides of the cups to coat them. Pour any excess melted chocolate back into the bowl. Chill the lined cups in the freezer for 10 minutes, until the chocolate is set. Spoon a generous teaspoon of peanut butter into each cup. Tap the cups on the counter to smooth the tops of the peanut butter cups. Pour a teaspoon of melted chocolate on top of the peanut butter in each cup. Chill the cups in the freezer for at least 10 minutes to set the chocolate. You can chill the cups in the freezer or the refrigerator to harden the chocolate. Because of the coconut oil in the chocolate mixture, the cups will be a little soft at room temperature. The cups are much easy to unmold when cold.